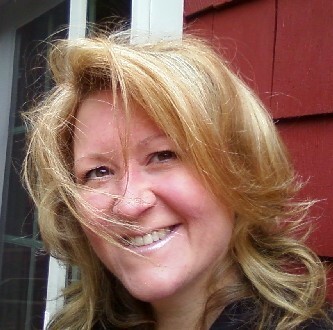 Sharon Hill is one of our favorite skeptics, we don't always agree, but she is fair and and extremely good at forming her argument. Better yet, she is thorough and a great fact checker, disciplines we think should be innate in any skeptic, but some self-proclaim skeptics just don't have the DNA for it. She covers a few news articles we have also covered here at BLC. She mention the New York Times: How to Hunt for Bigfoot and the SantaCruz.com: Hunting for Bigfoot in the Santa Cruz Mountains. 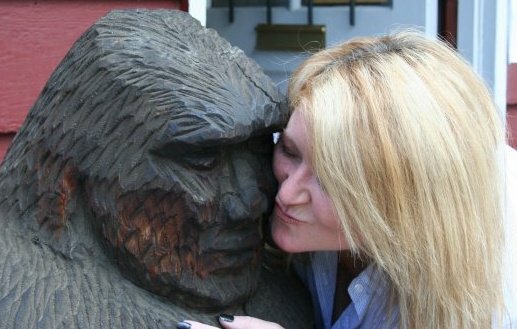 You can read her take on both articles at Skeptic.com: Serious searchers seeking Sasquatch, or Shenanigans? (nice alliteration by the way). 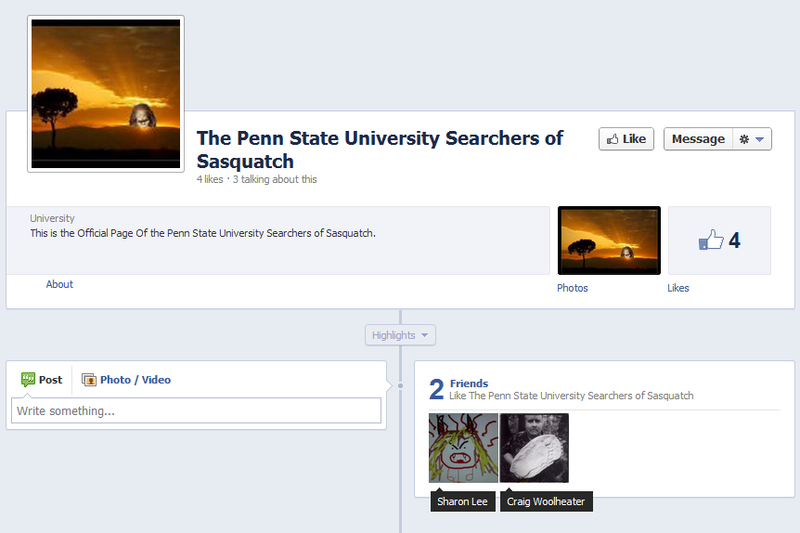 She also showcases a third article we have not covered here at BLC, the Penn State paper, The Collegian, mentions an unofficial Penn State club titled, "The Penn State University Searchers of Sasquatch". You can read The Collegians full article below. This is where Sharon's skill at going beyond the article is appreciated. In the article the Club claims 140 likes in it's "club," but in actuality it there are only 4 members. 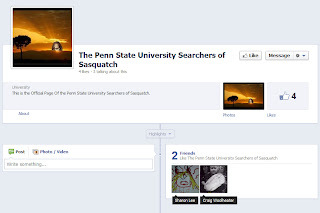 We can add to Sharon's reporting, at least two of the four Facebook members are not Penn State students, but Craig Woolheater of Cryptomundo and Sharon Lee of The Bigfoot Reporter. At the very least The Collegian article is entertaining. Although it is not made completely clear this is a lampoon. 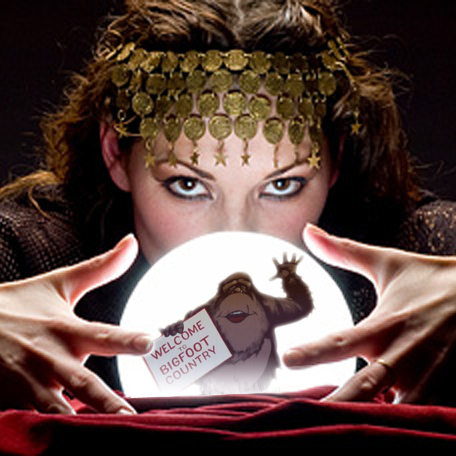 There are some indicators like the, "The Book of Squatch" and the new method of "Bird Squatching". Please read the full article below. In the darkest part of the deepest woods surrounding State College, he waits. His footprints dot the peak of Mount Nittany; he hunts in Sunset Park and wanders through the trees of the Arboretum. His existence has been questioned for decades, neither proven nor disproven. He is the Sasquatch. At least, that’s what some Penn State students believe. For those who have always known in their heart that Sasquatch exists, for those who believe the ever-elusive creature still roams the woods unseen and even for those who remain skeptical of its existence: the “Searchers of Sasquatch” are here. It started with a TV show and a couple college friends hanging out and watching the popular show, “Finding Bigfoot.” The Searchers of Sasquatch, although not yet named an official Penn State club, is a group dedicated to searching for the mythical creature known as Bigfoot or Sasquatch, said Mark Kasting. 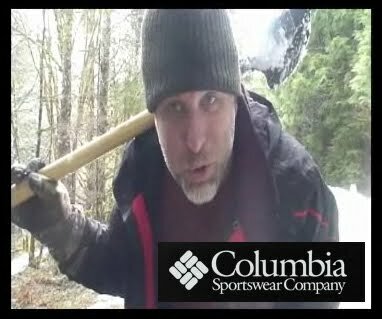 Kasting, better known as “head squatchman” and one of the creators of the group, said he and his friends watched others searching for Bigfoot on television and soon realized that they had a passion for it, too. They decided to form a group the week before spring break, Kasting (junior-astronomy and astrophysics) said. And so, the Searchers of Sasquatch was born. Kasting said the group is currently in the process of creating a club constitution and getting an adviser, although Kasting said that such a club requires a “certain type” of adviser. Jack Bagby and Bruce Etter are two members of the Searchers of Sasquatch who helped create the club alongside Kasting. Bagby (junior-philosophy and Greek) said he focuses on the ethical aspects and issues that come with “squatching,” such as dealing with non-believers and skeptics, while Etter (junior-sociology, psychology and English) focuses on the social aspects, such as keeping up a strong group dynamic when students are out on the hunt. Kasting, Bagby and Etter said their love of Bigfoot also goes hand-in-hand with the love they have for nature. Kasting and Etter have hiked the Appalachian Trail, while Bagby was a Boy Scout. And Etter said he’s already discovered some photographic evidence of Bigfoot, citing a footprint he found in State College that he could not explain. Etter described the print as belonging to a “large, five-toed creature,” which was neither human nor bear nor dog. Kasting said the Searchers of Sasquatch don’t currently have meetings because there is no on-campus classroom large enough to house their members, which reached 140 on Facebook as of press time Thursday. Searching for Bigfoot is not a free-for-all among believers, but an organized group effort that requires a set of rules for squatchers to uphold and live by. The Searchers of Sasquatch are not just students who wander in the woods casually searching for the mythical creature, though. The group is governed by a set of pillars and is in the process of writing a “Book of Squatch,” with information, research and rules about the search for Sasquatch, Kasting said. Some of the pillars include rules like “Everyone can squatch,” “No area is unsquatchable” and “Squatching is fun.” However, there are also very serious pillars, like the killing of Sasquatch, which is one of the most “unsquatchman-like” things a person can do. Kasting also said another pillar is the idea that searching for Sasquatch becomes instinctive. The instinct to search for Sasquatch is usually triggered by “squatchy” territory. Kasting said a squatcher will feel in tune with nature and know when he or she enters squatchy territory. One of the final pillars states, “Squatching is forever.” Etter wondered aloud when the hunt for Bigfoot would ever end, since the search for Bigfoot has gone on so long already. But Kasting said that the hunt for Sasquatch will never end, even if someone were to find Sasquatch or one of his many offspring. Etter echoed these sentiments, saying that squatching is more than an attempt to find Bigfoot — it’s a lesson learned. Being successful in the hunt for Bigfoot requires more than walking into the woods and taking a look around. There is a unique technique required if a person wants to have any chance of catching a glimpse of the mythical creature. Bagby said the best place to search for Bigfoot is in large forests that contain big objects to hide behind, and the “further you get” into the forest, the “squatchier” it gets. He added it appears as though in the State College area, Bigfoots are not sedentary, and instead of settling down, they tend to just pass through the area. Despite knowing where the Sasquatch prefers to live, it’s still difficult to attract them because they are intelligent creatures, Kasting said. Etter said that there are some important tips that can help anyone search for Sasquatch. One of the first things to remember, Etter said, is to be respectful. 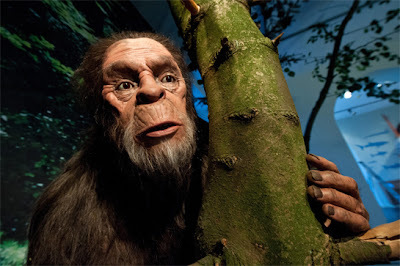 Kasting added that keeping a good attitude is important because sometimes, the search for Sasquatch can be discouraging, especially when there are so many non-believers. However, for those who believe, Kasting said being attentive and observant of the qualities of nature will go a long way. Bagby said observing the way birds react to their surroundings in the wild can give clues as to where a Bigfoot may be hiding. In 1967, Roger Patterson and Bob Gimlin announced the first report of a Sasquatch sighting in the U.S. The pair claimed they captured video of a Bigfoot on film. While many sightings have been proven false, this sighting still stands as the sole evidence of Bigfoot’s existence. Nearly 45 years later, the search for Bigfoot is alive and well, especially on Penn State’s campus. Kasting said he thinks the biggest reason people still search for Sasquatch is for the pursuit of something unattainable. Etter echoed similar sentiments, saying that everyone has their own “squatch” they are constantly searching for. 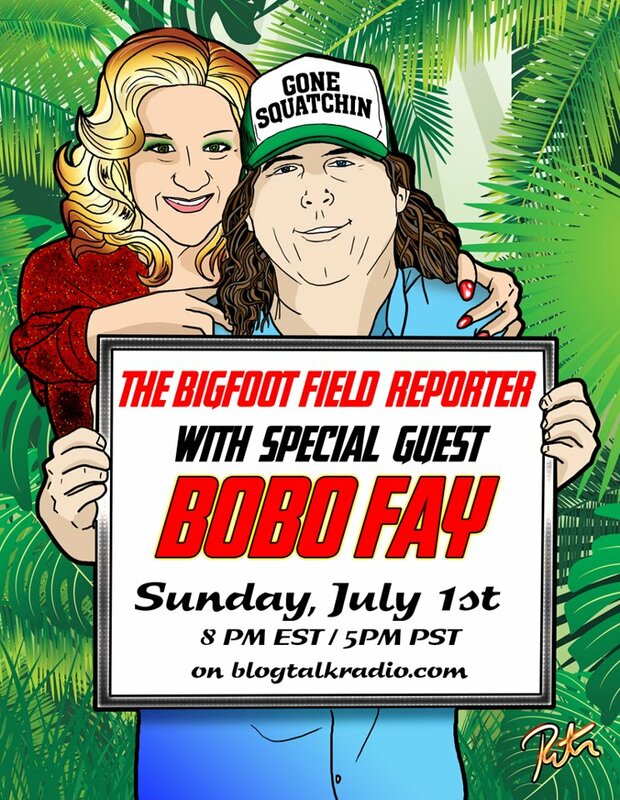 Aside from the philosophical search for meaning through squatching, Bagby said another reason people find such fascination in Bigfoot is the fact that Bigfoot is a creature more relatable to humans than any other creature. But anyone, even those who don’t believe in Sasquatch, can join the group. Kasting said believers and skeptics alike are welcomed to join the Searchers of Sasquatch. The main idea, Kasting said, is that people are coming together. Etter said that he personally is unsure of the existence of Bigfoot. Despite his doubts, he said it’s crucial for all people who look for Sasquatch to have fun and keep searching. Its no secret David Paulides is a controversial figure in the Bigfoot community. One post on Cryptomundo by Loren Coleman criticizes him for propagating the M.K.Davis fantasy. On Paulides' North America Bigfoot Search site, they announce tonight's interview on the upcoming events page. David Paulides will be on "Coast to Coast AM" this Sunday morning [sic] (Really Monday morning from midnight-2am) discussing the latest research that NABS has been working on. The discussions will center on the research conducted in the past versus todays eforts and findings. "...past versus today's efforts?" Will this be an attempt to hit the reset button and distance Paulides from his earlier, more controversial stands? Are we reading to much into this single sentence? Either way, even if he isn't planning on resetting his public relations image, most of the crew at Bigfoot Lunch Club feel he should--if not for himself, for the community. Regardless it should be interesting tune in to Coast to Coast for the last two hours to hear what the new research David Palides is up to. Conveniently embedded above is the 90 minute episode of Sharon Lee's Radio Channel. She had all her radio equipment at the meet and greet last Friday and was able to catch some choice interviews. The episodes starts with one BLC's dearest friends, Cliff Barackman. To promote and share research, information and events regarding the existence of the unlisted primate species known as sasquatch or bigfoot; and to help further education and understanding to the public regarding the species, throughout the United States of America.